The majority of missing persons are located within three days; most are located within 24 hours of being reported missing however some investigations can go on for months, even years. 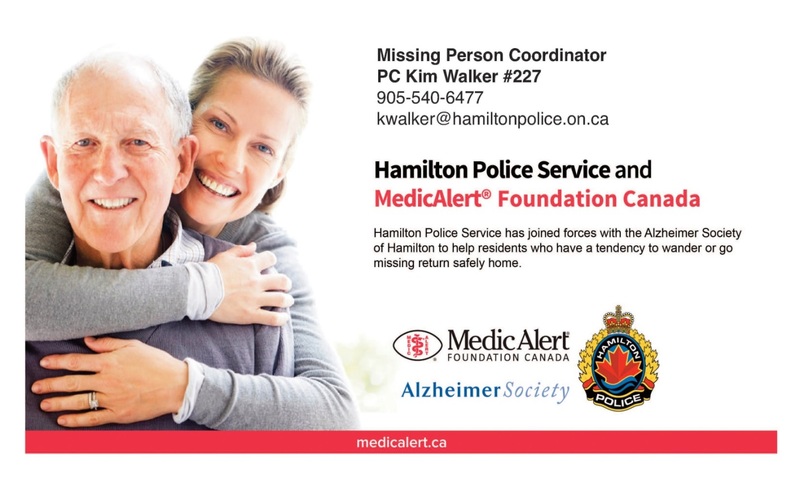 This new partnership provides Hamilton police officers with direct access to personal and caregiver information relating to some of Hamilton’s most vulnerable citizens through their MedicAlert ID bracelets. This will benefit citizens who are prone to wandering away from their environment regardless of age – children and adults living with autism, seniors affected by dementia, and others living with cognitive disorders. In an emergency, this new service, called MedicAlert Connect Protect, gives police officers direct 24-hour access to a registered MedicAlert member’s photo, identity and medical information through their MedicAlert ID. Connect Protect helps officers with information to conduct their search more efficiently, ensuring those who have gone missing are reunited with their loved ones sooner. Hamilton Police recognize the need to investigate missing person’s reports in an efficient and effective manner. The primary question when determining if a person is missing or not is: Is this out of character for this individual? To ensure all cases are handled appropriately and ensure the continuity of the risk assessment, all missing persons must be reported to the police information line at (905) 546-4925.